You just had your carpets cleaned, now you’re wondering how to keep those carpets looking clean and fresh for as long as possible. One of the first things you probably want to consider is whether to apply a carpet protector. We run into a lot of questions and reservations from our clients, so we thought we would addres a few concerns and questions to help us with that decision. Does carpet protector (when applied correctly) keep my carpets looking clean longer? Does the protector meet my warranty standards listed from my carpet manufacter. Does the protector really help resist stains? Are all carpet protectors the same? And finally, is it safe for my family and pets? At Surface With A Smile, our protector of choice is DuPont Teflon® Advanced Carpet Protector. There are many reasons we use this particular protector, take a look at the comparison chart below and you’ll see why. 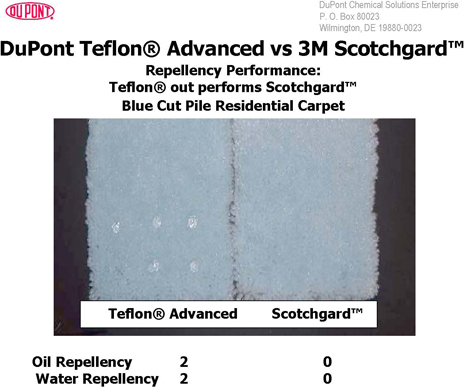 Teflon® Advanced is a new, improved carpet protector that provides superior repellency and outstanding soil protection for all types of residential carpet. Teflon® helps carpets stay cleaner, brighter, newer and fresher through all kinds of daily wear! Creates a unique invisible shield around carpet fibers. Teflon® Advanced Carpet Protector provides more repellency than other leading carpet protectors, along with outstanding soil protection. This means you can be assured of cleaner carpets longer, and that means greater satisfaction for you. The improved, advanced repellency of Teflon® Advanced Carpet Protector provides extra time to clean up spills, minimizes wicking and the spreading of stains. Teflon® Advanced is more resistant to oil-based and water-based stains than ever, thanks to its higher repellency. Dirt and stains cling to untreated carpet and quickly become embedded in the fibers. Teflon® Advanced creates a powerful invisible shield around the carpet’s fibers to keep dirt from lodging within the carpet. The same technology that keeps foods from sticking to pots and pans prevents dirt and grime from sticking to the carpet. Does Cleaning Remove the Teflon® Protector? Under normal conditions and with reasonable care, Teflon® Advanced Carpet Protector will provide long lasting benefits. Research has shown that Teflon is very durable to foot traffic. 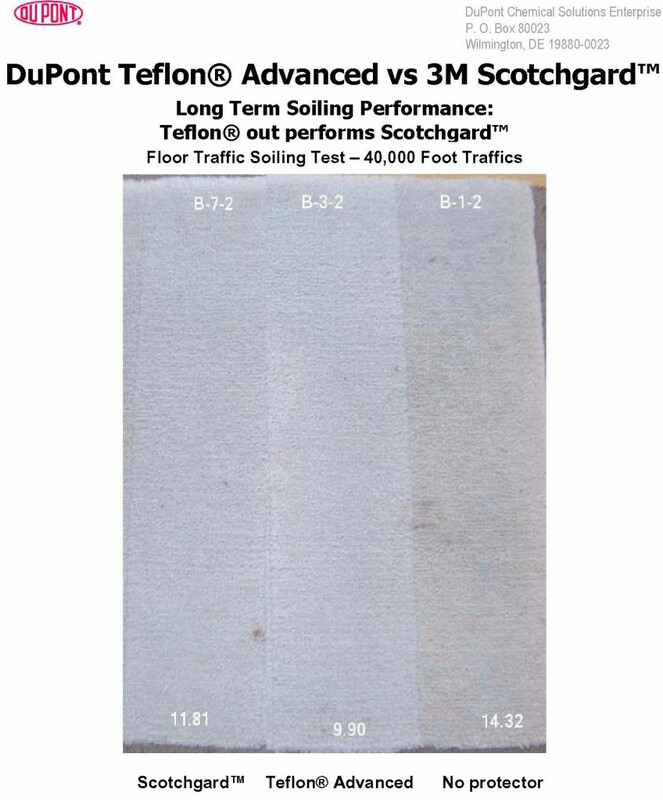 Some Teflon® Advanced Carpet Protector is removed from the fiber from heavy traffic over time or aggressive cleaning. Some product may also be removed by strong cleaning agents and chemicals. Generally we recommended to re-apply Teflon® Advanced each time the carpet is cleaned. What is the difference between the mill applied and after market products? The mill applied products are formulated for drying in the high temperature ovens found in carpet mills, while the home applied products are formulated to dry at ambient temperatures. Because the mill applied products are “baked on”, they are typically more durable, depending upon the product. However, Teflon® Advanced has good durability and provides valuable protection against soil and stains. How often should protectors be applied? Since the biggest enemy of the protectors is abrasion from traffic, and traffic varies with each situation, the general recommendation for re-application is after each cleaning. The same conditions that led to the need for cleaning probably have led to the need to refresh the carpet protection. How are carpet warranties affected? Carpet mills recommend reapplication of Protector to maintain their warranties. Shaw Industries’ R2X™ brand carpet warranty is voided is by “treatment after installation by any product other than DuPont Teflon® or 3M’s Scotchgard™…”. DuPont™ recommends the application of Teflon® Advanced after each cleaning on all carpet types, even those with built-in soil and stain protection. Reinforces stain-blocking! Can Teflon® Advanced be applied to upholstery? Yes, Teflon® Advanced also works on upholstery that is not subject to water damage as is silk and other more exotic fabrics. Teflon® Advanced is suitable to protect upholstery made from most cotton, nylon, polyester, and blends of these fibers. But if water damage is a possibility or a concern, do not apply the product. Does Teflon® Advanced contain formaldehyde? No. Teflon® Advanced does not contain any formaldehyde. Is Teflon Advanced safe for children and pets? Yes. Teflon® Advanced product s go through extensive testing and have been safely used in homes. Does Teflon® Advanced have an odor? Teflon® Advanced is odorless. Once applied to carpet, it does not release any chemicals into the air. However, other components in newly manufactured and installed carpet may cause an odor for a short time. Proper ventilation will minimize this. Doesn’t the application of protector cause furnishings and carpet to re-soil faster? 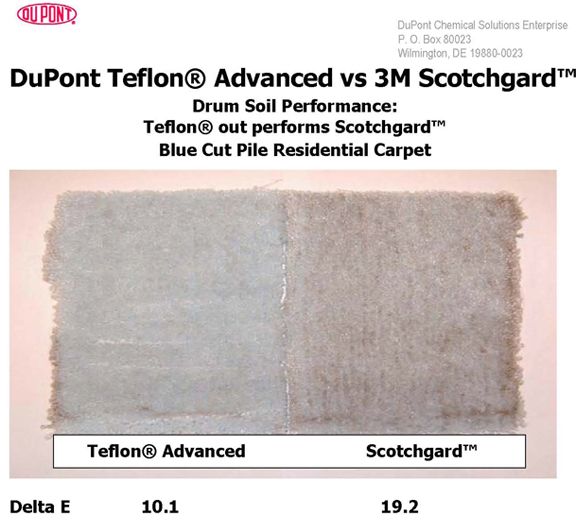 Some of our clients have heard that protectors, such as Teflon or Scotchgard, is not only ineffective but that it actually causes furnishings and carpets to soil faster than their untreated counterparts! That is ironic to us because the main reason we recommend Teflon® Advanced protection is because we have found it is very effective at impending re-soiling! Applied properly, Teflon® Advanced cots each little fier with a clear seal tht wraps around its nooks and crannies. This seal will resist soil from penetrating each tiny individual fiber. The soil will not be as likely to bond and thus can more easily be picked up with an ordinary vacuum. Your carpets and furniture will stay cleaner longer with Teflon® Advanced. In addition, the protectant will help resist stains, spills and spots (sometimes in dramatic beading fashion). It is important however, to clean up all spills immediately and to maintain regular vacuuming even after the application of Teflon® Advanced. Soil is abrasive and if not removed will eventually break Teflon® Advanced invisible barrier.